The Metropolitan Police released photos yesterday of some of additional "tools" used in the recent terror attacks on London Bridge. Surprisingly, they included plastic water bottles. 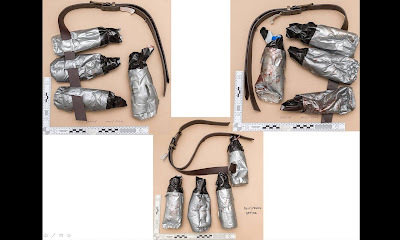 The bottles had been covered with duct tape to create an element of mystery or the unknown and were attached to a belt worn by the attackers. They weren't filled with anything, but I have to admit if I saw a group of knife-yielding attackers wearing such equipment (assuming I could completely overlook the knives), they would look real enough for me. I'm assuming the bottles looked in better shape prior to the attack, and upon closer examination in an environment in which no one's safety is a concern, the lack of visible wires makes the devices look suspiciously fake. Even after the attackers were "neutralized", the bottles would still need to be considered a serious bomb threat until decided otherwise which leads to more concerns for authorities even after an event looks to be over. I don't know if this is the first time "duct-taped-water-bottles-as-real-looking explosive devices has been used, but I would expect to see more of them in future attacks around the world (a statement that saddens me to write). All of this really emphasizes that "the belts made the bravery of those who took on the attackers even more remarkable". The information you shared here is unique and informative which is very rear to see nowadays.Incredible post keeps up posting such great information.You can use this essay writing service for any kind of academic writing work.Really appreciate this wonderful post that you have provided for us.Great site and a great topic as well i really get amazed to read this.